Introduce students to the fascinating world of electricity with this convenient and economical package that includes all basic materials needed to investigate key electrical concepts. Demonstrate the flow of electricity from power source, through conductor, to an illuminated light bulb. 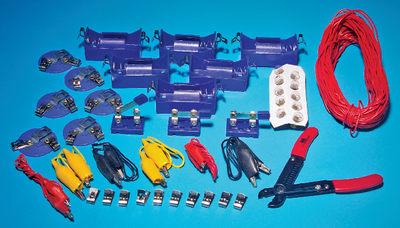 Experiment with various wire materials, gauges and clips to discover the most efficient system. Batteries not included.Includes:Six round plastic bulb holders; three knife switches; six battery holders with Fahnestock clips; ten additional Fahnestock clips; one wire stripper; three 18" wires with alligator clips; three 18" wires with banana clips; 100' of 22-gauge insulated copper wire; and ten 1.5V bulbs.